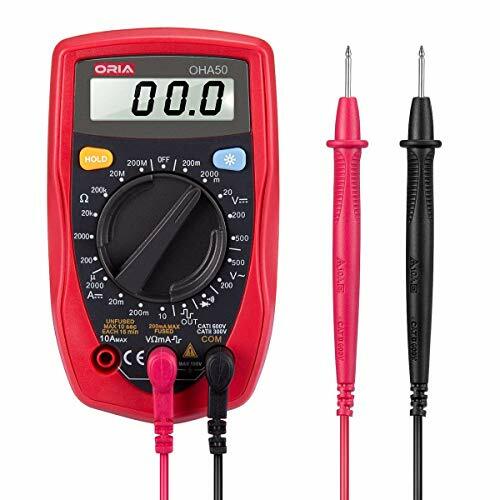 1.Precise Measurement: The Digital Multimeter accurately measures AC/DC voltage, current, resistance, diode, continuity Square wave (output) and etc. 2.Safe and Quick-The meter is designed and conforms to compliance with standards of IEC 61010, Category I, 600V overvoltage. And built with double insulation, All ranges have overload protection. The measurement speed updates 2/3 times readings per second. 3.LCD Backlit and Data Hold- Clear readings with the large backlit LCD screen. The data displays clearly and easy to read. The data hold function for easy reading after measurement. 5.Wide Uses- This multimeter is widely used to solve the electrical problem in household, school and industrial devices such as electronic equipment, automotive, domestic appliances power supplies and so on.